First North American Urban Vertical Farm Opens in Vancouver! Last month, the first commercial vertical farm in the world opened in Singapore. This week, Alterrous systems opened up its first vertical farm on top of a parkade in Vancouver. It feels like just yesterday that we were blogging about the initial stages of construction of the farm. We couldn’t help but smile at the picture below of Vancouver mayor Gregor Robertson enjoying his first taste of vertically farmed produce. Vancouver is well on its way achieving its goal of being the greenest city by 2020. November 29th Edit: Please do not misunderstand what we mean by “First Vertical Farm in North America”. 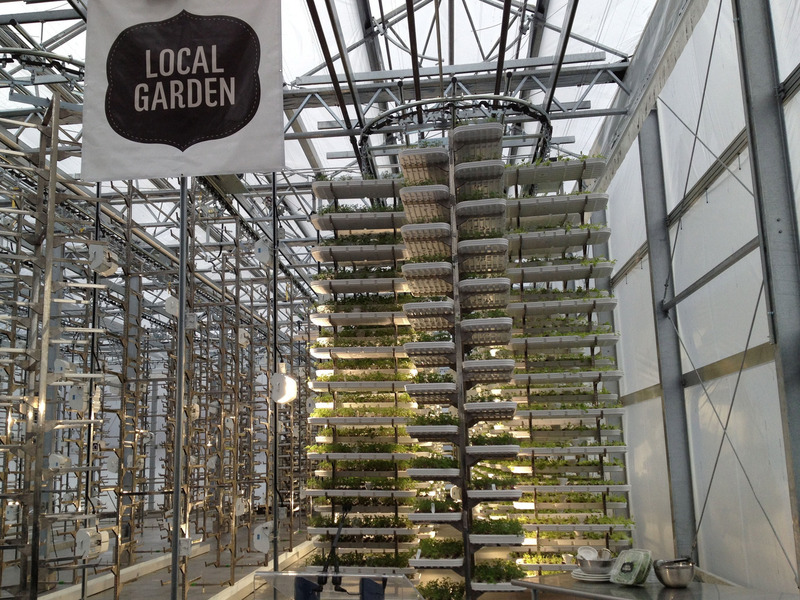 We have added “Urban” to that statement as we realize that it is misleading to say Local Garden is the first to grow crops vertically using hydroponics. Other businesses, such as Terrasphere have been growing certain crops on dense vertical shelving units in a suburb of Vancouver for years. Locavores, look no further than the 10th floor of a downtown parkade for homegrown, leafy greens. The first vertical urban farm in Vancouver – and in North America – harvested its first commercial crop of greens, kale, spinach, arugula and fresh herbs Tuesday from the rooftop of the Richard St. EasyPark. The clean-tech farm is green, innovative, creates local jobs and occupies unused space, making it a “win-win” for Vancouver, Mayor Gregor Robertson said at the launch event. Plus it lines the city’s pockets. Vancouver-based Alterrus Systems Inc. leased the underused parking space from the city at market rates and built the greenhouse with its own cash. The $2-million, 6,000 square foot Local Garden, as the crops are branded, will employ between four to six people from Downtown Eastside organization Mission Possible. The original VertiCrop system at the U.K.’s Paignton Zoo grows produce to feed animals, but this is Alterrus’ first attempt to sell to commercial markets. It expects to produce 150,000 pounds of produce annually. The crops take about 20 days to grow and are rotated through the conveyor system to get maximum light exposure. While the greens will be sold to those who can afford them, Alterrus is looking at opportunities to pay part of its lease fees in produce to contribute healthy food to city organizations, strategic advisor Donovan Wollard said. Local restaurants and grocery stores such as Fable, Hawksworth, Spud.ca and Urban Fare want to buy the greens rather than ship the highly perishable items from as far as 2,000 kilometres away. This entry was posted in Uncategorized and tagged agriculture, farm, urban, urbana agriculture, vancouver, VERTICAL FARM.